I'm experimenting with an RSS feed for this web site. That will let folks get updates when I actually add content -- either in the news section, the artwork section, or the tutorials section. If it becomes necessary, I could split the feeds up into individual sections, as well. To "subscribe" to updates from the RSS feed, click on the rss file link. Your browser should prompt you after that. Things have been moving along, with each little project proceeding. Writing has slowed down at my other blog, so I'm updating here. It seems like there will be a shift there, and it will either pick back up, or die off completely. Work is going well -- we're surviving the downturn by, well, being a large diverse company. Some customers are doing just fine these days, and our products and services that they use are, likewise, doing just fine. We're tightening the belt, but we'll be fine. Soccer took an odd turn last week, as we got run off of our field the police for the terrible crime of playing a group sport in a recreational park. The officer doing it felt pretty dumb having to enforce this particular town rule, but since a lily-livered intolerant racist called the police to complain about us, he had to come serve and protect. Normally I'm more guarded about casting dispersion upon others, but since the complaintant's given reason for not just speaking to us himself was that "none of the players spoke any English" -- I'm fairly comfortable making wild (and probably inaccurate) assumptions about him in return. Now, most of the guys are Hispanic, but not all of us (certainly not the big English/Nigerian actor). He just wanted a nice cozy assumption to save him from having to man up and voice his opinion to a group of other dudes. And also, he should get a real dog. I think his major worry was that our soccer ball would roll over his "purse-sized dog and crush it with the fierce weight of 14-16 ounces. Archery is going well, but I've hit the nasty accuracy "valley" that comes from changing equipment. I changed to a stronger bow setup, and changed arrows to a faster, but less forgiving type. This means that it takes more endurance to shoot a competition, and all of my mistakes are magnified. The tradeoff for this is that the bow can now shoot nearly 100 yards, instead of 65. Maya has had an interesting summer -- now it is offered as a bundle along with MotionBuilder and Mudbox. The next year of Maya will be interesting to see how shifts like this help form a base for new interoperability features. For the first year in a while, we've stayed here for Christmas. Jen's family came in for New Years, and we got to do touristy things around LA. We saw the Rose Parade floats being built, and spent a day down at Disneyland. It was a very fun visit. 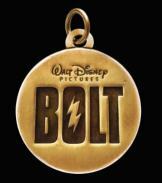 The latest Disney Animation movie that Tony worked on -- "Bolt" -- opens next week on November 21st. This one actually even has Tony's name in the credits (for the first time ever)! That's only the 2nd time ever (that he knows of) that someone from his company has gotten their name in the credits of one of their customer's films! 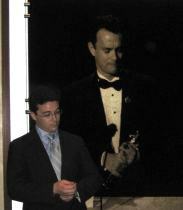 In addition to having Tony's name on a ridonculously large screen, the movie itself is really great, as well. It's really a huge step up in quality (yes, even from Meet the Robinsons!) and the beginning of the real return of Disney's magic. Available in 3-D, and the non-fat 2-D version with 33% less 'D'. Look for Tony under the "Strike Team" category in the credits. The news is varied, but of a medium quality lately. ALA was in town this month, providing various library-affiliated goodness to its members. BOLT production continues to churn along. Tony managed to get a golden watering can in Animal Crossing. All in all, it seems like we're all waiting to hear news about the new nephew. Not that we don't love the old nephew, it's just that we already do hear news about him.